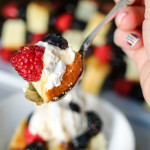 Three Berry Shortcake Skewers are stacked with delicious juice berries and pound cake, then drizzled with a sweet raspberry infused balsamic reduction which takes this dessert to the next level! Now that spring is on it’s way here, I have been obsessed with incorporating berries into my daily meals. Over Valentine’s Day I made a fun strawberry skewer, but I thought with all the delicious berries in my grocery store, I could make a Three Berry Shortcake Skewer, and then drizzle it with a balsamic reduction, and it would be the perfect treat! Thank you, Alessi Foods for sponsoring this post today, as always all opinions are my own. Putting the three berry shortcake skewers together couldn’t be easier! 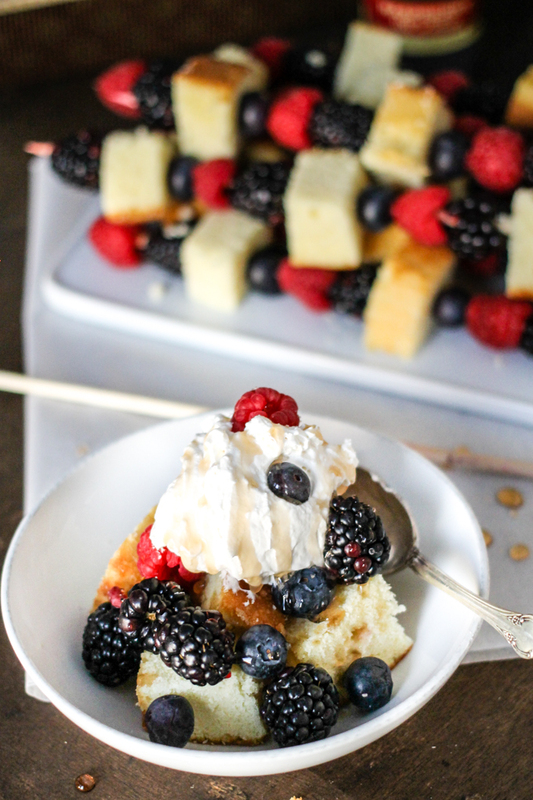 All you need is berries, pound cake (or angel food cake works too), Alessi Raspberry Infused White Balsamic Reduction, and whipped cream – simple. 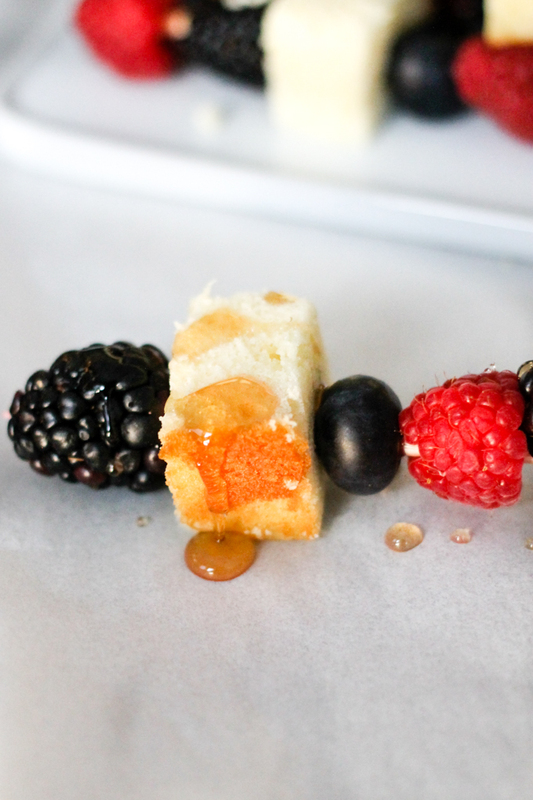 Stack your berries onto your skewers and add some cake in between. 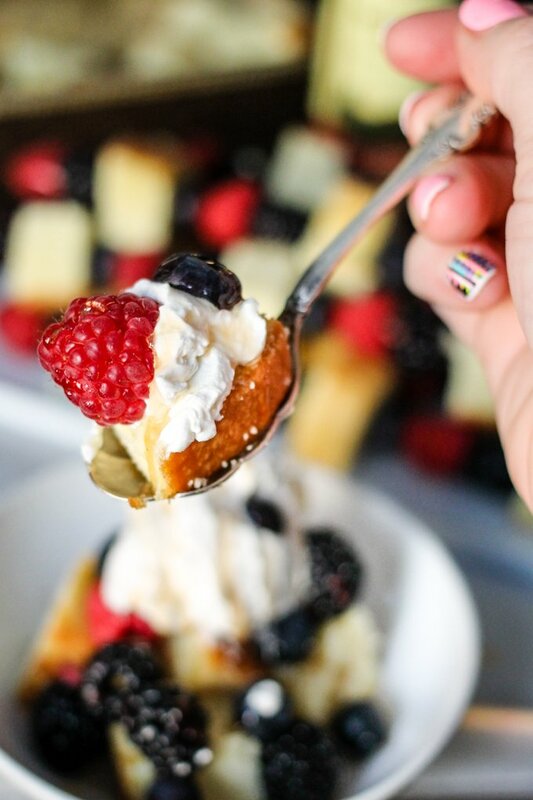 When you have all the three berry shortcake skewers put together, drizzle the Alessi Raspberry Infused White Balsamic Reduction over the top – it’s sooooo good! I loved using this reduction on the skewers because it’s a sweet syrup like product and adds the perfect flavor pop to the skewers. It is created by taking a liquid (like vinegar) and thickening and intensifying its flavor into a sauce. This can be done by boiling the liquid and adding sugar and other ingredients. 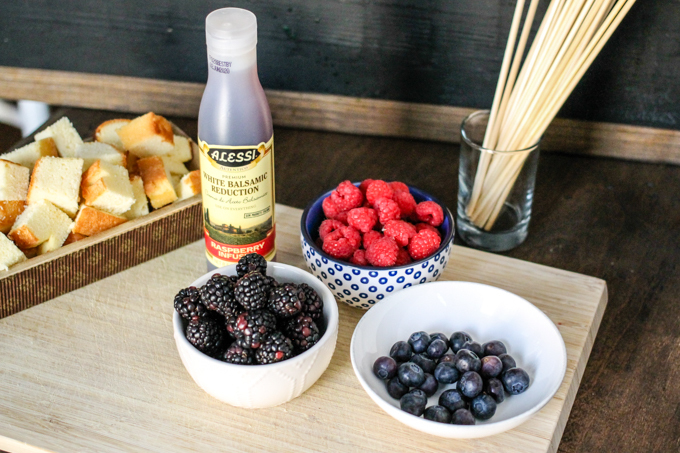 Alessi’s is a lighter more runny reduction that makes it great to drizzle over foods without being too heavy. Additionally, the flavors used in Alessi’s reductions (there are SO many different flavors) are intensified since they aren’t being hidden by unwanted fillers. In fact, Alessi’s Classic Balsamic Reduction only has two ingredients, so you don’t have to worry about unwanted chemicals in your food. I really like serving the skewers alongside a bowl so that people have the option to put everything into the bowl. 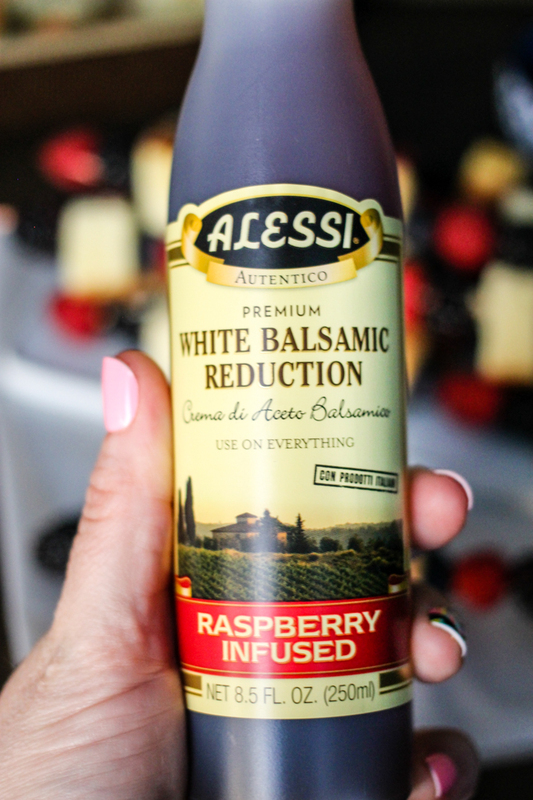 Once you slide everything into the bowl you can add a bit of whipped cream to the top, and add a little more Alessi’s Raspberry Infused White Balsamic Reduction, yum! Alternatively, if you are like my kids, you can leave everything on the skewer and dip it into the whipped cream – there is no wrong way to eat these! Need ideas on when to serve Three Berry Shortcake Skewers? Having a girls night in?! Make a dessert bar and let the girls assemble their own skewers. Let everyone choose from various Alessi reductions for drizzling! Hosting a 4th of July BBQ or attending an event? These bright and colorful desserts are the perfect dessert to serve! 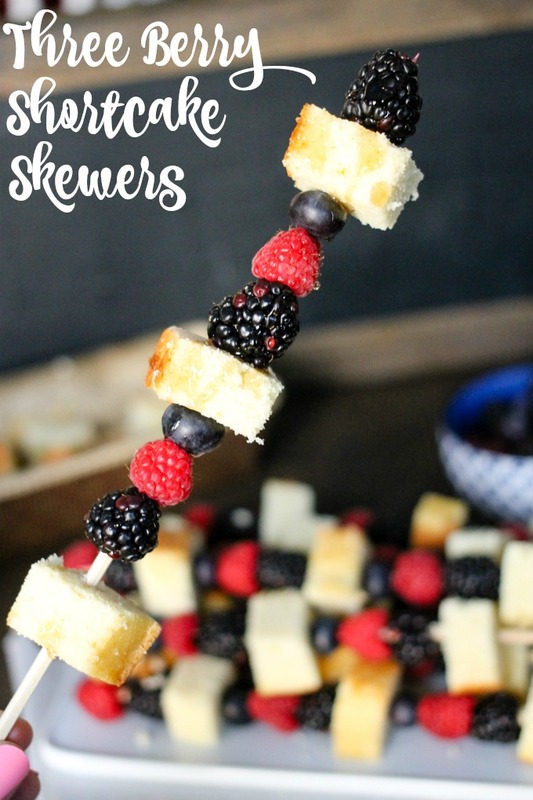 Work potlucks are easy with Three Berry Shortcake Skewers – whip them up and then serve them standing in a glass – gorgeous! 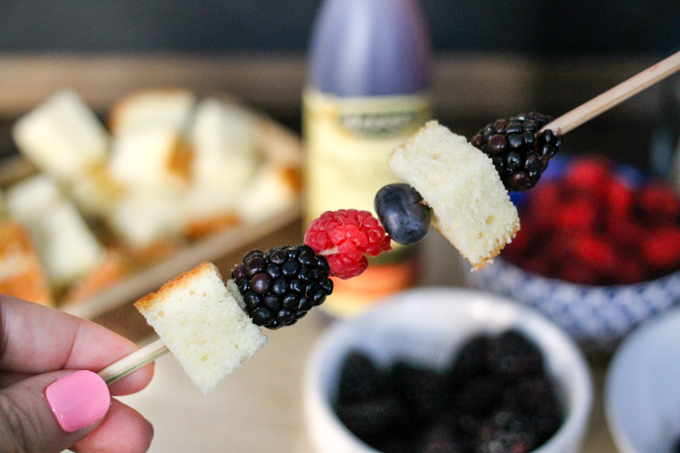 Using wooden skewers, alternate berries and pound cake while sliding them on the skewer. Repeat until skewer is filled. Repeat for all berries/skewers. 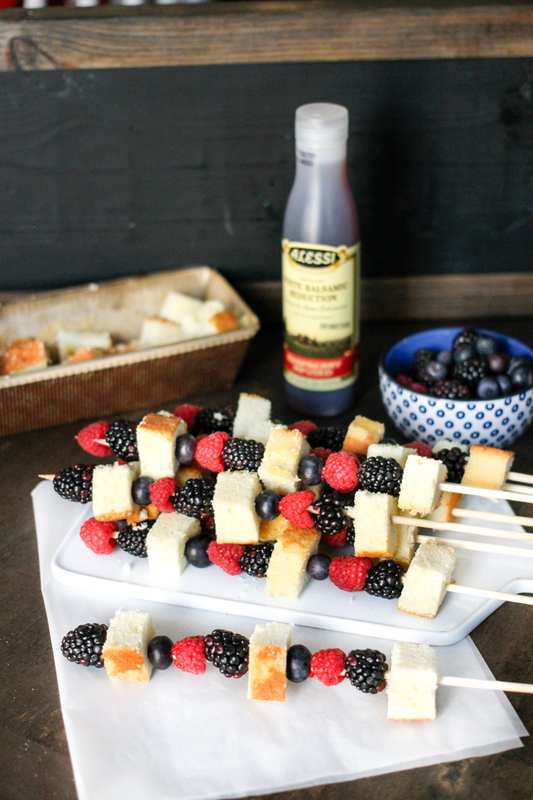 Drizzle Alessi Raspberry Infused White Balsamic Reduction over the top of the skewers. Serve either in a bowl, or on skewer with whipped cream on the side for dipping. Visit this site to find stores that carry Alessi products near you or order online!